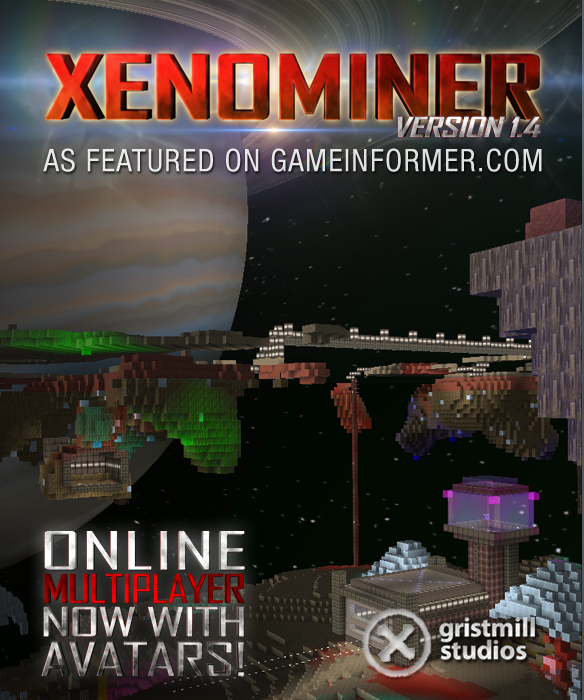 After weeks of tough development and an endless supply of your patience, Gristmill is proud to announce the release of XenoMiner version 1.4: The Multiplayer Expansion! Starting today, space will get a little less lonely as you bring friends into your worlds to see what you’ve made and build together. The full change log is available on our forum, right over here. If you don’t have an account there, please make one. The forum is a great place for long discussions with other fans and the developers about features, updates, requests and your builds. When you first load up an old world there may be a delay as it changes over to our new format for saving. The more changes you have in your world, the longer this could take. This should only be in the first load, subsequent loads should be faster. Auto Saves should be faster, but please let us know if you see any problems. Gravpads will give you an impulse, at the top you will now bob up and down. Autosave was decreased to every 3 minutes. Containment Units are only usable by the player who placed them. Containment Units can only be removed by the player who placed them. Containment Units drop items when picked up. Slight Hud Bob while looking around. There is an error catching screen. If the game has a problem, you will get a message about what happened. If you can try to take a picture and post it with your bug report on our forums. Activate this by selecting Multiplayer Beta in the options menu. Only the host can acquire and control the bot. You can make your world Public, Friends-Only or by Invitation. Host will have the ability to Kick and Ban. There are currently no animations for either model type. There are currently no effects for either model type. Make sure you quit to log out so the host is sent your final state information. The “invisible” door frame bug no longer occurs. Reclaim fix for stacked items. Invisible block “black hole” should be fixed. Switches no longer take up entire voxel. User options save as intended. This entry was posted on Tuesday, April 2nd, 2013 at 1:11 pm	and posted in Gristmill, XenoMiner. You can follow any responses to this entry through the RSS 2.0 feed.